Using magnetic stickers for cars is an easy, quick and fun way to promote a business without a big investment of time or money - and without damaging the paint job on vehicles! So you want to advertise your new business, but you'd rather not commit to a custom permanent paint job for company vehicles? Custom paint jobs are expensive, time consuming, and require the vehicles being worked on to be out of service for some time, something that very well may impact your business. Instead, with magnetic stickers for cars, your personnel can easily, affordably and quickly display any information you want on vehicles, whether it's a vehicle number, your company name, the logo, contact information, website URL or anything else! What many of our customers like to do is order a few of these magnetic stickers for cars and have their staff members take turns using them. Because these custom magnet bumper stickers are not adhesive, they can easily be rotated between staff members for maximum exposure. What better way to market your brand, whether a vehicle is parked in a lot or on the road, or it's moving through city streets? 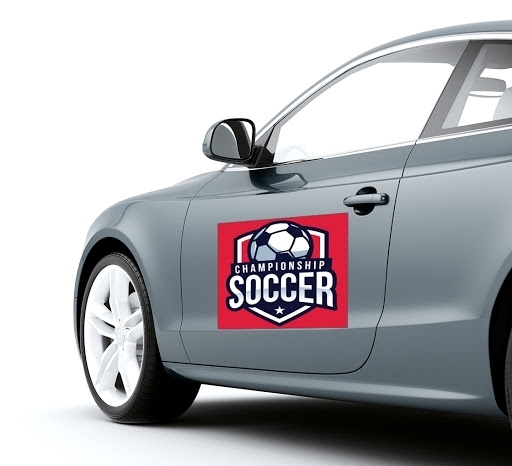 Engaging with prospective customers using magnetic stickers and car decals makes advertising on the go just about as easy as it can get! At BannerBuzz, our custom magnetic stickers for cars are made to tolerate the harshest weather conditions for six to 12 months. 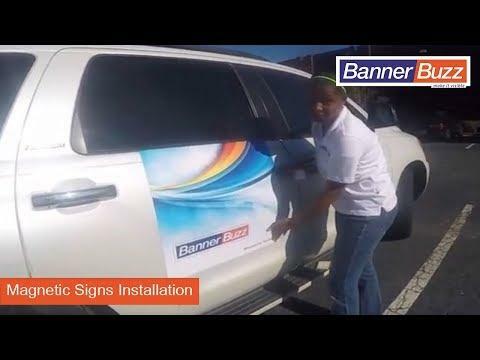 You won't have to worry about your stickers falling off while you're driving on the freeway or are stuck in rush hour traffic because the corners of each banner are rounded to fight the wind and remain on the car. In addition, the backing on our custom magent bumper stickers is very strong and high in quality. We have a gallery full of templates for you to choose from, but if you want to make the most out of your custom magnetic stickers for cars, we also have a web application that will walk you through the steps to make the ideal promotional piece for your company. Get started today and design your own custom magnet bumper stickers with BannerBuzz!